Hollywood Central Park schematic site plan. Los Angeles, are you ready to design your own Central Park? 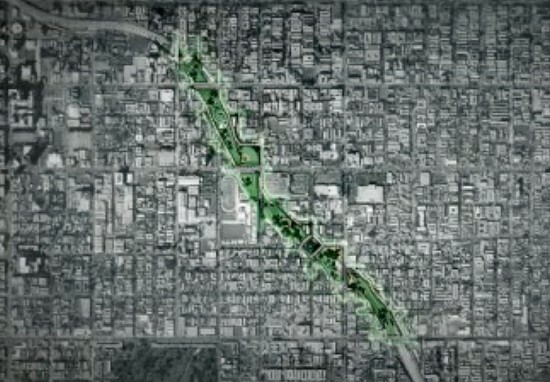 Friends of the Hollywood Central Park (FHCP), a nonprofit formed in 2008 devoted to developing a 44-acre street-level park capping Hollywood’s 101 Freeway, has initiated a new web feature encouraging residents to imagine their own dream parks in order to transform Hollywood’s densely populated, park-deprived neighborhoods into healthy, prosperous green spaces. In collaboration with Central Hollywood, East Hollywood and Hollywood Studio District Neighborhood Councils and the Hollywood Chamber Community Foundation, the ambitious venture will reunite the communities presently separated by the Hollywood Freeway. The Design Your Own Park tool makes it possible for individuals to create their own versions of Hollywood Central Park by offering a range of possibilities to choose from, including large features such as fields, cafés, dog parks and libraries and smaller features such as rocks, trees, and benches. The site’s simplicity makes it easy to participate in the design process, and the tool also allows users to invent their own park elements. A Psomas Engineering cost estimate marks the total development price at approximately $1.15 billion. As a result of an $825,000 grant from the city and a $1.2 million donation from the Aileen Getty Foundation, the landmark infrastructure project is one step closer to making the park a reality. The plans are now under environmental review, and a scoping meeting and community meeting are expected to take place in the near future.The Draft Environmental Impact Report will be open for public comment in 2015.